It's a shame that we'll probably never see these Zerg in StarCraft II - they look just peachy to me. Judging by popular sentiment on Blizzard's Battle.net forums - and even its official stats, the creepy-crawly Zerg race seems to be a bit underrepresented in StarCraft II these days. And yet, when the dust had settled from the first Global StarCraft II League (GSL) competition, the winner was a bona fide member of the Swarm - a player who went by the name of "Fruit Dealer" (or sometimes "Cool"). 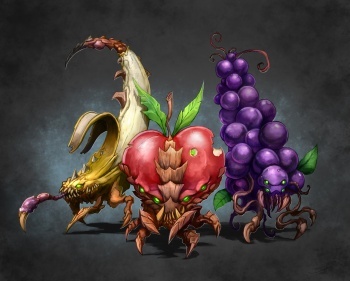 To commemorate Fruit Dealer's infested rise to the top, Blizzard unveiled concept art for three new Zerg units - the Grapeling, Applelord, and Bananalisk - on the official StarCraft blog. While I suppose that we could always see these three new units make it into StarCraft II: Heart of the Swarm, the odds seem sadly against it. Still, you never know: This is the developer who included both Terra-Tron and the Tauren Marine in the game (and map creator) as easter eggs. I think we can all agree that if the Zerg looked like this, though, they'd have gone extinct long ego for just being too gosh-darned delicious.